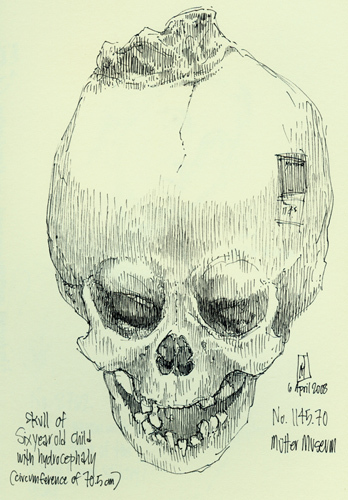 This is another sketch from a visit to the Mütter Museum of the College of Physicians of Philadelphia in April 2008. The Mütter has one of the world's finest collections of unusual anatomical specimens. Among them is this skull of a six-year-old boy afflicted with hydrocephaly, often called "water on the brain". The condition is caused by excess cerebro-spinal fluid building up in the skull. The pressure forces the bones of the skull to stretch and strain like a balloon. Today, the condition is treated with shunts that drain the fluid into the abdomen where it is reabsorbed; but before that technique was perfected, a hydrocephalic lead an uncomfortable life, often unable to support the weight of their own massive cranium.